June 14 1945 Hello Dave, Was very glad to receive your little paper and it's very interesting news. You are sure doing a wonderful thing for the fellows and I hope they all appreciate it as much as I do. 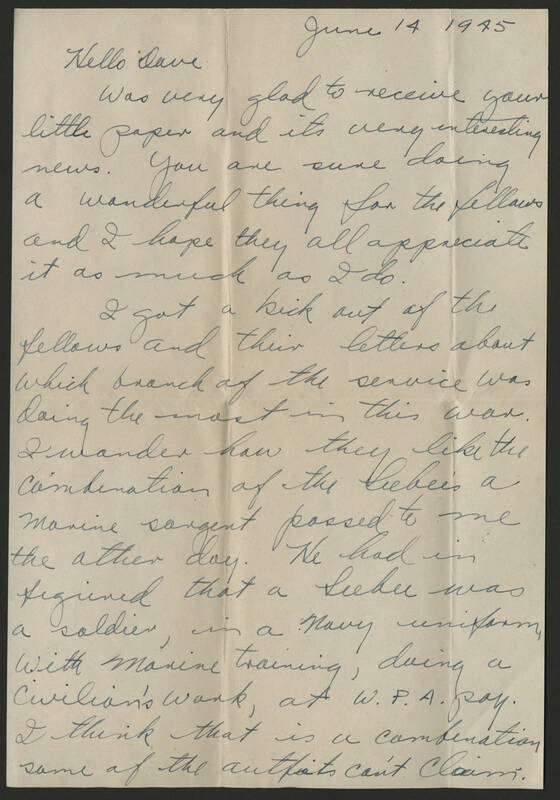 I got a kick out of the fellows and their letters about which branch of the service was doing the most in this war. I wonder how they like the combination of the Sebee's a Marine sergeant passed to me the other day. He had in figured that a Seebee was a soldier, in a Navy uniform with Marine training, during a Civilian's work, at W.P.A pay. I think that is a combination some of the outfits can't claim.